WE have been associated with them for four years. They offer many activities for the residents that are top quality. The rooms are maintained at a high level of cleanliness. The staff is kind, courteous, and helpful. The common properties (inside and out) are clean, cheerful, and welcoming with decor that is appropriate for the season. They offer choices for each meal and are open to suggestion from the residents on ways to improve the dining experiences. Shirley, thank you for taking the time to highlight your experience with Highgate. We are honored by your five-star review. Staff and residents are all very nice and helpful. Steve is the best! Highgate is a good fit for the resident who is not looking to be super-active. Hence, it is a good place for our mother. They offer light exercise, decent meals, bingo, happy hour and a van ride every week. Other activities are offered that are suitable for those that need assisted living, which is a majority of the residents. The population is smaller than some large places who may offer many more activities for independent residents. I do wish there were more employees to serve meals. Sometimes the wait can be a bit long. But overall, we are happy with how content our mother is. We moved my mom here who is 94 and still quite independent. Our experience has been more than wonderful. The facility is very well appointed and the staff so welcoming and competent. The food is excellent with high quality ingredients and served by caring staff. The activities are great too and the atmosphere is very positive. My mom absolutely loves it and so do we! My parents initially moved into one of Highgate's independent living villas. At the time, my mother was in the middle stages of Alzheimer's and my father was suffering from congestive heart failure. One of the key attractions of Highgate was that they could handle my mothers needs as she progressed with Alzheimer's, and we wanted a consistent environment for her during the process. We visited several assisted living communities in our search, and although some had more impressive facilities, we were drawn to the smaller size of Highgate and the overall happier feeling of the staff and residents. It was clear that with the smaller size that the caregivers know the residents well and genuinely care for them, and that has remained consistent throughout the years as my parents have progressed from independent living to assisted living (father's stroke) to memory care (mother's advanced Alzheimer's), all within Highgate. The people that work at Highgate, from top to bottom, are the main reason we are very satisfied with Highgate. Even with the expected turnover over the years, they continue to hire some very special people that clearly care about the wellbeing of my parents. On many occasions we have witnessed caregivers going above and beyond their duties in showing kindness to my parents. Something as simple as a caregiver just sitting and talking with my father for awhile, or the director taking my mother out for a drive to get a milk shake. I have interacted a great deal over the years with the staff both in person and on the phone, and they always know who I am and who my parents are. If I need to come pick them up for anything, I just call the reception desk and let them know when I plan to pick them up, and they will be sure that they are ready to go. In particular, mother is always clean and well groomed and dressed, which is no easy task in her late stage of Alzheimer's. I most certainly would choose Highgate again, and I give them my highest recommendation. I moved my mother here to be closer to my sisters and I. The staff at Highgate have all been helpful, caring and very understanding. I definitely recommend Highgate. Mom is in the assisted living part of Highgate. We choose it because of the number of residents, its location and the overall feel and look of the facility. It's more homey and not such an institutional looking situation. The people who run it are very caring and there is a lot of young energy there. The staff makes it more personal by introducing me to a couple of residents and let them talk about their experience there, where they come from and they are very open about it. It isn't as though as a program presentation. I feel very comfortable visiting my mother. One thing that is important to me is that they are taking charge of her meds because sometimes her memory is not good enough that she's messing up on that. If someone needs extra care like my mother as there is a concern that she may fall and no one would really know it, she has a call button on her chain around her neck at all times and any time that she needs assistance or help, she pushes the button and they respond right away. That is big comfort to an elder person because they are worried that people aren't going to hear them when they need help and that is a relief. They are all very concerned and they always know where she is and what she's doing. It is an open door policy. You can come and go any time you want and the residents who are able to go around on their own, they come and go as they want. They have both independent living and assisted living. They have little apartments on the exterior part of the main building for independent living, they have assisted living that's more of apartments and then they have memory care. My mother is 93 years old and not too interested with activities, but there were a lot of success stories with people that have come in in wheelchairs and walker and because of being involved and actively exercising regularly and just getting out and about, they are no longer using those devices. They are much healthier. They have a nutritionist who works with them and the food is very nutritious. She hold open session and invites all the residents and families or whoever are interested to come in and talk about the menu. It is very informative and it is also a venue for the residents to speak up if they have something they don't really like in the food or the menu. The meals are balanced and they customize the meal to the needs of the person individually. They just seem to be overall happy there. You don't hear a lot of complaining. 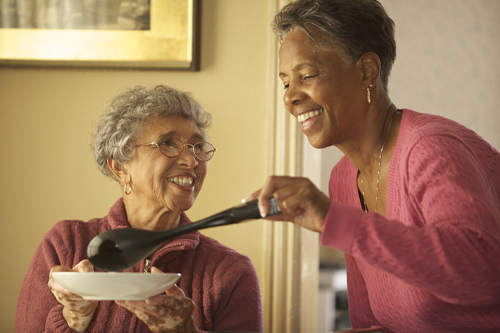 Highgate Senior Living has independent, assisted, and mental care. They're very caring people. They know everybody and anybody that comes to their front door by name. I can't believe how they remember names. Very efficient and very prompt on calls that are made to them. Nursing staff is very, very good. Food is very good. Old building. Everyday, there's something different, and they have happy hours. They have entertainment that comes in once a week and they take their people to different places. Many varied activities. Highgate is awesome. Everybody there is really good. They are good with my mother-in-law. She just loves it there. She has been there for three months now. She really likes her room. The facility is very clean. The staff all seems like they really care a lot. Because my mother-in-law has memory problem, she has to be taken a little more care of and the staff is great there. I would really recommend that place. Also my brother's wife had her father there and she really recommended Highgate to us. We're very happy with Highgate. The staff was very accommodating. We're very pleased with them. They residents play cards, they go for bus tours and they have entertainment come in. The food is wonderful. Superb staff. I spend a couple of hours there each day with my Bride. I am amazed by how they lovingly interact with each resident, accommodating the needs of each. My mother has severe Alzheimer's. We were at a point that she needed to go into a care facility. I researched, and visited, numerous sites. When I went into Highgate, I was impressed immediately. During the visit of the memory care unit, the Director said hello to and knew the names of patients in the unit. Some of the patients, those that could, even communicated back knowing her name. The other staff were interacting with patients that showed care, activity and help. Most of the other facilities had very little interaction with patients, these units were quiet and the staff seemed just there doing a job. At Highgate, I was very impressed with the Director and her honest concern for my situation and mother's needs. The staff at the facility showed that they wanted to be there, had interest in every patient and their unique needs. The facility was clean, bright and provided a large area for movement, activities and interaction. After moving my mother in to Highgate, her whole condition has improved. She has put some healthy weight on, her facial impressions show more interest and observance of all activity around her, she is well fed, clean and daily activities have improved her actions and movement. The staff is caring, show interest and concern, friendly and even in times they need to be more firm with a patient I've only seen them handle in a professional and positive way. I only have one mother in this life, and having to deal with such an awful condition as Alzheimer's, I am very happy that she, and my family, have the wonderful help she is getting at Highgate. Thank you for sharing the statistics and information about people living with dementia. We love what we do and are happy to help anyone looking needing it. Highgate at Vancouver is a senior living community with a view of Mount Hood. It's conveniently located near parks, walking paths, movie theaters, churches, shopping, pharmacies, doctors, medical clinics, and a hospital. For those affected by Alzheimer's or other forms of dementia, the community offers a separate and secure residence called The Cottage. What should caregivers and potential residents know about Highgate at Vancouver?